Following City Commission approval in May, Kentwood released its tentative road construction and maintenance schedule for the summer. For regular updates of this schedule, including lane and road closures, please visit our road construction webpage. May 16, 2018 - Following City Commission approval, Kentwood has released its tentative road construction and maintenance schedule for the summer. The City Commission approved the resurfacing and maintenance program, which includes improvements to 22 miles of major and local roads, at a cost not-to-exceed $892,000. The projects are funded through the Michigan Transportation Fund, which is supported by taxes on the sale of gasoline and diesel fuel as well as the fees collected by the Secretary of State for vehicle registrations. 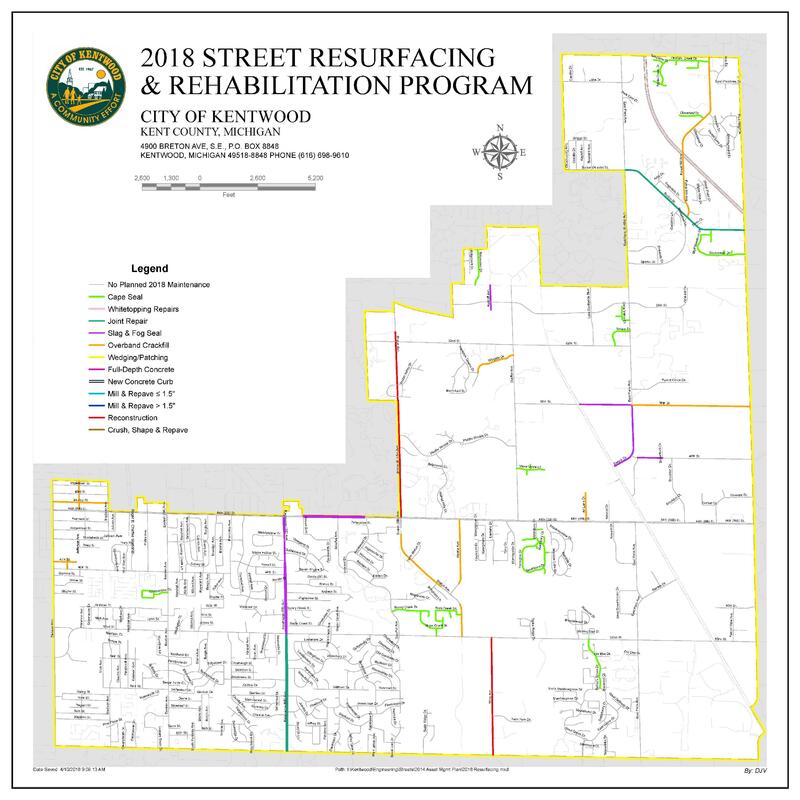 Kentwood maintains the highest-rated major street network in Kent County according to data compiled by the Grand Valley Metro Council in its 2017 Regional Pavement Condition Survey Report. Additionally, Burton Street from East Paris Avenue to Patterson Avenue and 40th Street from East Paris Avenue to Soundtech Court are also slated for projects. Barring any unforeseen circumstances, work on Kalamazoo Avenue will begin in July. From 52nd Street to 60th Street, the road will receive a joint repair treatment. From 44th Street to 52nd Street, it will receive a chip seal treatment. Both types of work will protect the road from water and sun damage. From 52nd Street to 60th Street, the road will be closed for two days in August, during which commuters will need to take alternate routes. A chip seal treatment on 44th Street between Kalamazoo Avenue and Breton Avenue will take place in July. The project will take up to three non-consecutive days to complete and will include lane closures. Traffic delays near 44th Street should be anticipated; commuters are encouraged to find alternate routes. A number of neighborhood roads will receive cape seal treatments this summer, which is a multiple component treatment designed to create a smooth surface with increased durability. Cape seal projects will take two non-consecutive days on each segment of road, and no street parking will be available when the work occurs. Other preventative street maintenance work, including routine street marking, crack sealing and patching is scheduled to take place during the summer months as crews have capacity. The City aims to have its resurfacing and routine maintenance completed by the end of August. The reconstruction currently underway on Wing Avenue from 52nd Street to 60th Street and the rehabilitation of Breton Avenue from 32nd Street to 44th Street are on track for completion in August. The City plans to display message boards on major streets to give residents advance notice of when closures will begin. Residents can also receive updates via the City’s social media channels (Facebook, Twitter) and website (www.kentwood.us). To view a map of planned street resurfacing and repairs, click here.